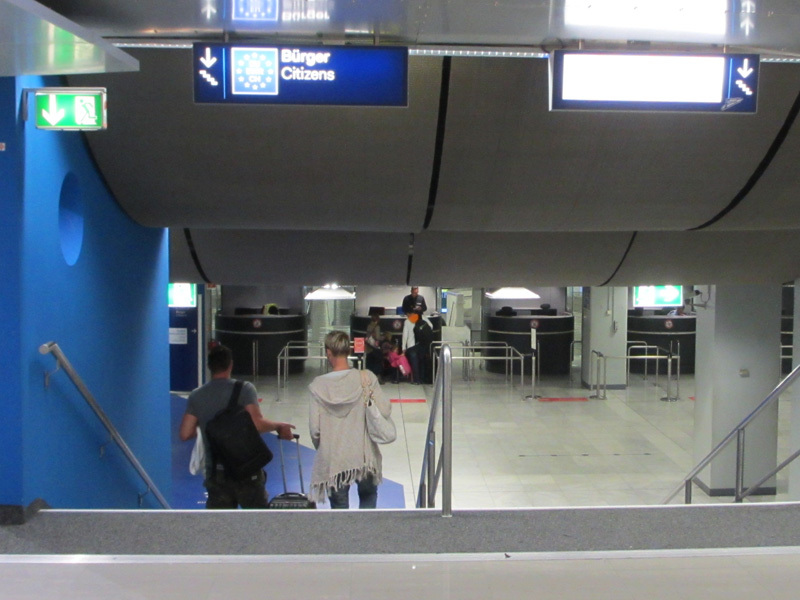 Arriving at Düsseldorf Airport – How to master the train price jungle! Oh no, it's a gruffalo! Ten Days to Go... Write if you can! Welcome to the ECIS 2015 Blog! After four intensive days of ECIS conference, and some relaxing days afterwards, there is now some time to take a look back. Luckily, there is plenty of user-generated concent that people shared via social media channels. Or with the words of our keynote speaker Helmut Krcmar: "Everything is public by default." Thanks a lot for your participation – here is my personal selection of social media highlights of #ECIS2015. After the first tweet was posted 728 days before the conference, the real fun started with the end of the submission deadline in November 2014. The deadline was featured on our website with a countdown in the top right corner, along with the respective tweets. For ultimate advice, we provided in addition some hints for random cuts in order to finish the paper on time: "Write if you can!". On February 27, we could finally announce the acceptance notices for ECIS 2015, which allowed us to plan the session layout. At this moment in time, we had already published 16 "Treasures of the week", secret places in and around Muenster that you will not necessarily find in your travel guide. On April 28, we entered the #Juchhu stage. After publishing the program we invited the participants with Twitter account to tweet their paper title and link to it. Thanks to @ellahsydney, @balbirbarn, @ElenaGorbi, @securescientist, @majestixx, and @lanamaeki for sharing their research. In the last month before the conference, you were able to follow our preparations on Twitter. We posted everything that is important for the conference and interesting for future visitors, and also everything that is neither important nor interesting. To explain ECIS 2015 dress code, we produced an explainer video. All in all, a great buzz. The day before the conference started, we met with early arrivers for a pub crawl. Best coverage of what happened was arguably provided by Jason Thatcher on his Facebook account. More detailed pictures were luckily not published (what happens in Vegas Münster, stays in...). Check this post for the full story. Thank you Mr President! On the next day, @jhillegersberg constantly kept us posted via Twitter about the progress of the participants of the Doctoral Consortium, who actually biked from Twente to Münster (50km), including beautiful pictures of the countryside. Before the conference, we imagined in the ECIS blog what would happen if ECIS 2015 was a soccer tournament. Our wish actually became true on conference Tuesday when 17 participants met at Soccerhalle Rummenigge to compete in 3 teams. One year before, Münster organizers had crashed the dance floor in Tel-Aviv. I guess, a new tradition is born... At ECIS conference dinner, our Turkish successors picked up the tradition and brought it to n+1. On that evening, people told me many good things about the conference. However, there were free drinks and everybody was in "relaxed mode". Thanks to @Kris_Ego, @aslisencerx, @HealthISLab, @CirielloR, @viadeeJava, @minemytext, @balbirbarn, @Anandstweets, @TGAsuperheroes, @ellahsydney, and @DrJSims to share positive feedback also with some sober distance. For me personally, ECIS 2015 has been an unforgettable experience with so many old and new friends coming to Germany. I think I speak for many volunteers when I say that I am very happy to be part of this exciting event. Gladly, we took a plethora of pictures to bring back the memories any time. Can't stop thinking on #ECIS2015? 1225 photos in our gallery bring back the memories: http://t.co/nzeS3WlMcw. Thx for your participation! Remember that guy at the conference, lurking around all the time to get the best picture shots for photo tweets on @ECIS2015... Outside ECIS 2015, Sebastian Köffer (@koeffi) works as research assistant at the European Research Center of Information Systems in Münster. If you would like to know more about the author, check out the author's website. Not a lot to say: Jan is Conference Co-Chair, Hilti Chair of Business Process Management, Director of the Institute of Information Systems, Co-Director of the International Master Program in IT and Business Process Management, and Director of the PhD Program in Business Economics at the University of Liechtenstein. 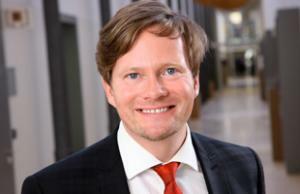 He is Vice President for Education at the AIS, President of the Liechtenstein Chapter of the AIS, and he serves on the University Executive Board as Vice-President Research and Innovation. So we were sitting there and thinking about the obvious question: "Imagine ECIS was a soccer tournament... What would it be like?" Here's our best of. Give us yours, we will add it! 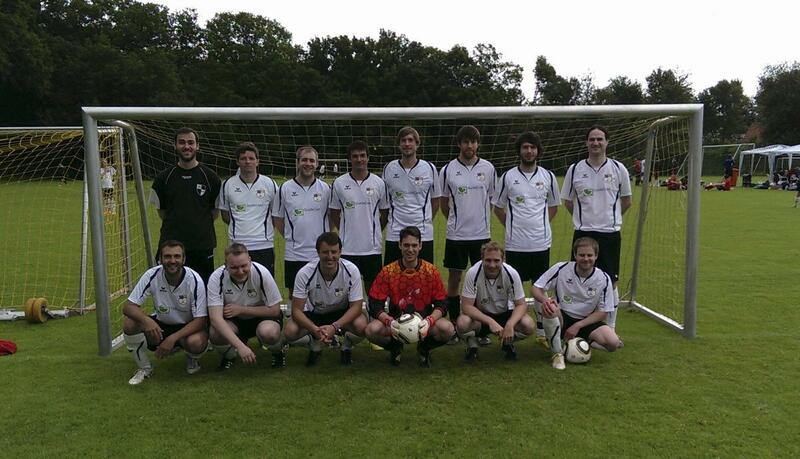 Send an email to imagineeciswasasoccertournament@ecis2015.eu! The presentation rooms will not fill up from the back but the front row (and the best seats are directly beside the stage). There would be a lucky loser round for the best-rejected papers. At the beginning of a session, the audience would stand up for the national anthems of the presenters. The Session Chair would clap your bum before substituting you for the next speaker. Your name would be chanted by the audience when entering the pitch. Signing another researchers’ name badge or shirt with a marker would not be seen as improper behavior. Wearing shin guards and cleats on stage is an essential part of the dress code. A live commentator’s dramatic voice accompanies the slide with conclusion. Jumping on the stage would be tolerated to avoid dangerous sliding tackles (i.e. nasty questions) of the audience. Cheering and waves during the presentation would be allowed. You could call the doctor or a substitution if your PowerPoint hangs. Too much text on slides would be punished by a yellow card. Some people would stand during your presentation although free seats would be available. 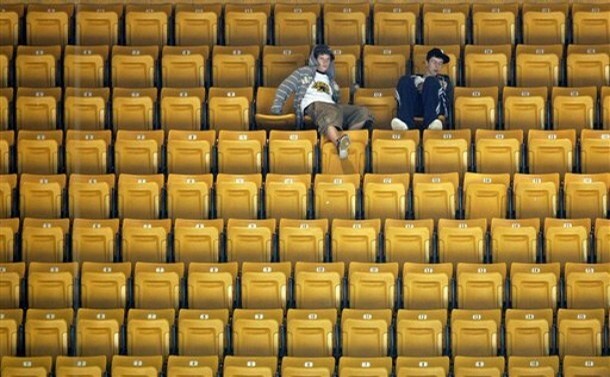 These people would also claim “that only standing guarantees full emotional support of your presentation”. The audience will provide you with creative support during your presentation. You will be awarded a “best of slow-motion video” after you presentation. After an excellent presentation, you would throw your shirt into the audience. If your presentation was bad, it might get your superior fired because he or she did not coach you well enough (remember: it is more expensive to exchange the whole team than the coach). Everybody would applause if you poured a big glass of Weizenbier over the heads of the Best Paper Award winners. Partying your best paper award with a beer shower is streamed to the big screens in all conference rooms. Running around holding your best paper award over the head during the conference dinner, and shouting the name of your University would be met with cheers. Best papers are awarded a travelling trophy including the names of the previous winners on the stand. Space reserved for you... Come on, be creative! Sebastian Bräuer works as a research assistant at the European Research Center of Information Systems in Münster. Born in Hamm (near Dortmund) he is looking forward to see his team at the DFB Cup soccer final in Berlin (unfortunately only from the couch). In his free time he likes to play soccer (e.g., for ZSK ERCIS), and he likes to take pictures, tons of pictures. 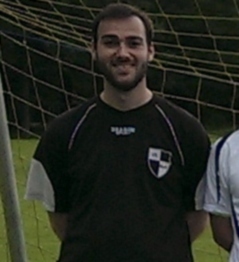 So most time during the ECIS, he will most likely hide behind his lenses. As international ECIS visitor, your German adventure may start at the airport “Düsseldorf International” which is the closest international airport to Münster. Despite the famous reputation of the German Autobahn, German rail offers arguably the fastest and most convenient transport to get to Münster. Getting there is generally easy. Nonetheless, I want to share with you some specific hints for a smooth arrival. Germany has a big train network. 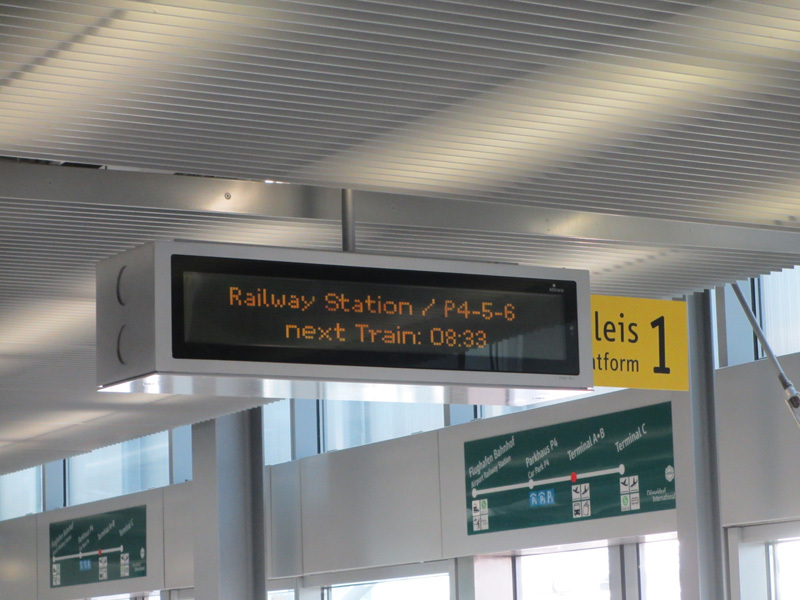 In fact, we have so many trains, that Düsseldorf Airport has two railway connections – one for the line S11 and one for S1 and all other connections. 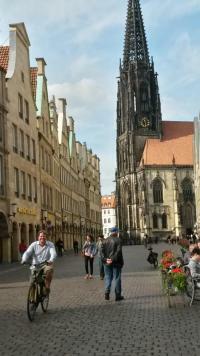 With S11, you’ll get to Düsseldorf city Centre, which is nice to see, but extends your journey to Münster. Route for S1 to reach Münster as fast as possible. 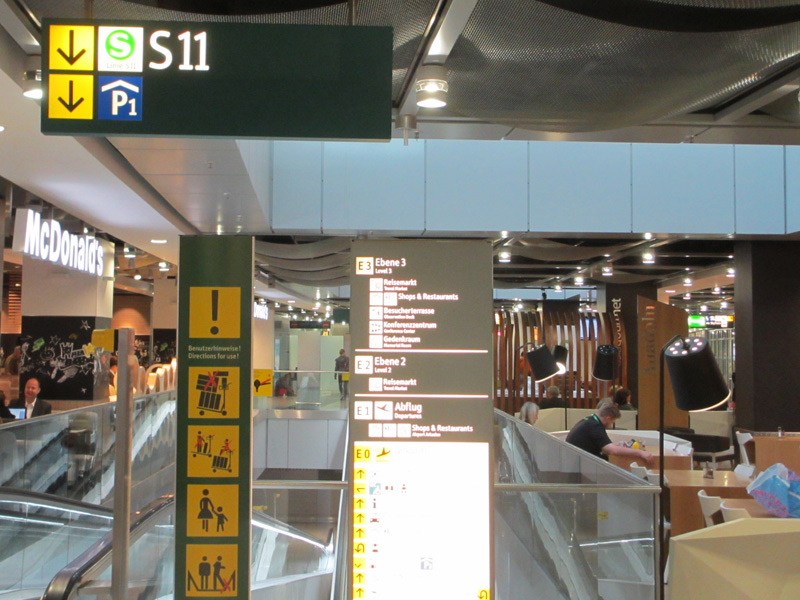 Unfortunately, the station for S1 is not located at the terminal. 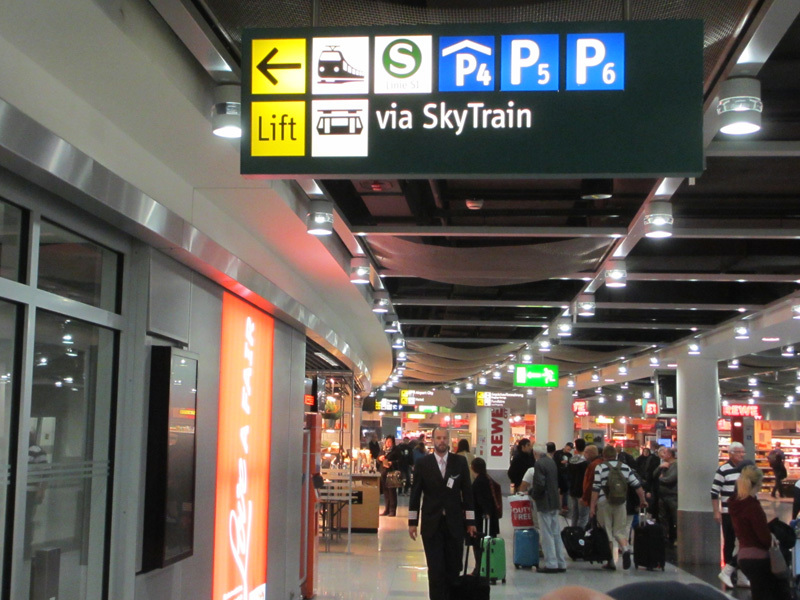 To get to the station, an automatic “Skytrain” connects airport terminal and railway station. 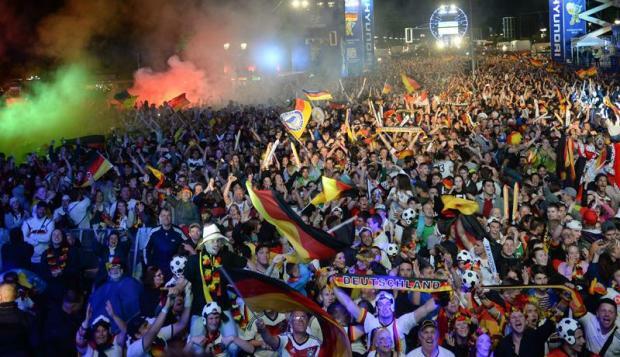 Recall that Germans like trains. But Germans also like rules. Together, this can be a terrible combination. German rail companies have invented a complicated tariff system that differs between the federal states of Germany and makes it sometimes hard to identify the cheapest ticket option. 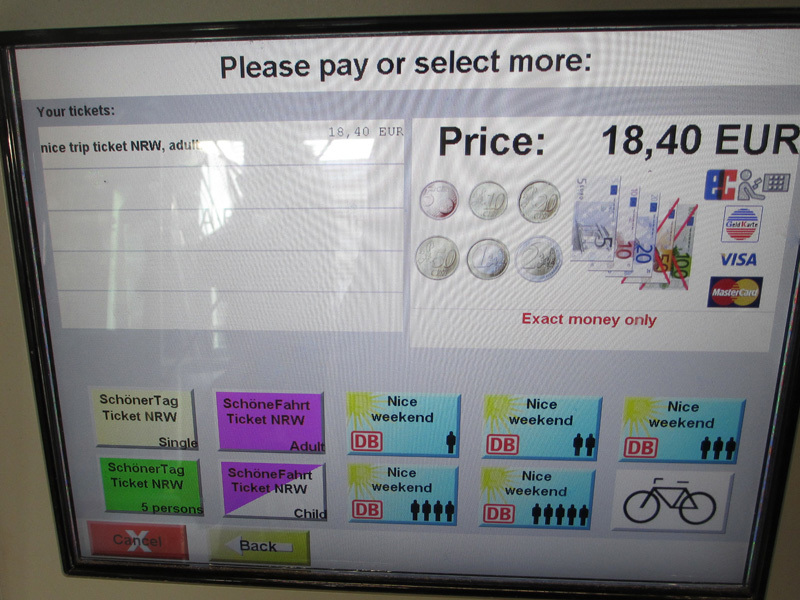 Before boarding the Skytrain, you are required to buy a ticket – not very guest-friendly! Anyway, be clever and buy directly a ticket to Münster and the Skytrain journey will be virtually free of charge! The good news is: Düsseldorf and Münster both lie in the federal state of North Rhine-Westphalia (official acronym: NRW). That enables you to buy special tickets that are only valid in this state. The best way to buy a ticket is the automatic vending machine at the Skytrain platform. If you are travelling alone, the cheapest ticket is called “Nice journey ticket NRW / Schöne Fahrt Ticket NRW” for 18.40 EUR. The ticket is valid for two hours, which is sufficient to get to Münster. If your journey gets delayed, the ticket is of course still valid. 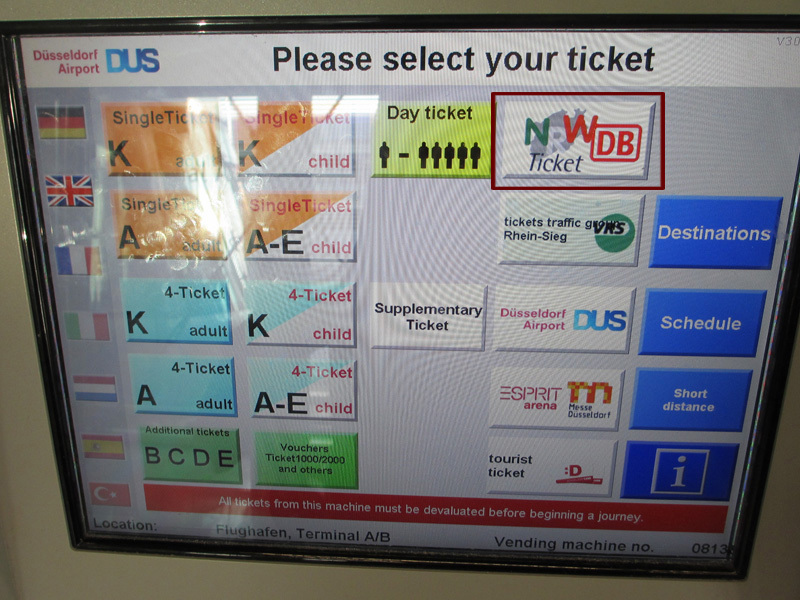 However, you are required to board the train directly after the purchase. 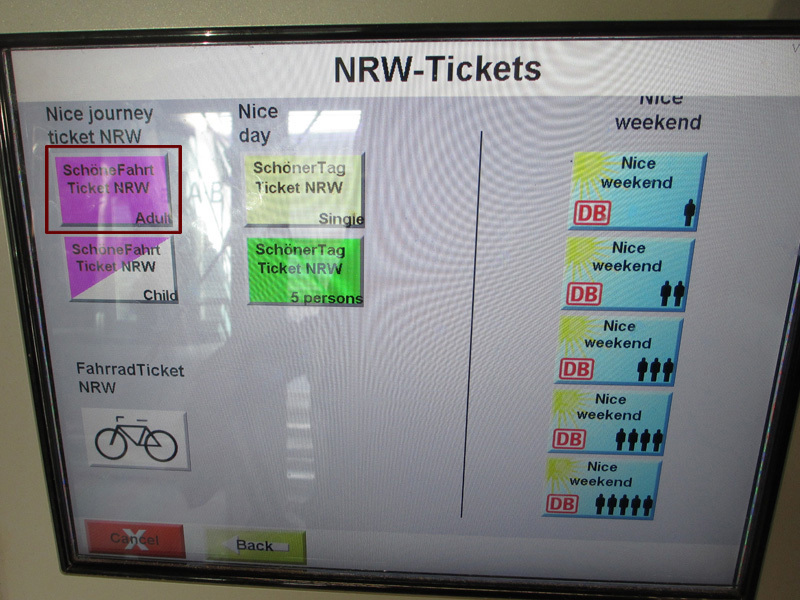 For all-day long travel all over NRW, choose “Nice day ticket NRW Single / Schöner Tag Ticket NRW Single” for 29 EUR. If you travel in a group of 3-5 persons, the cheapest option is the “Nice day ticket NRW 5 persons / Schöner Tag Ticket NRW 5 Personen” for 42 EUR. The ticket is valid for five travelers, all-day long, all over NRW. All NRW tickets are only valid for regional trains (RE, RB, S) and not for faster InterCity trains (IC, ICE). The latter trains are not recommended for the trip to Münster, since they are more expensive (28 EUR for a single journey) and offer almost no time advantage on this route. 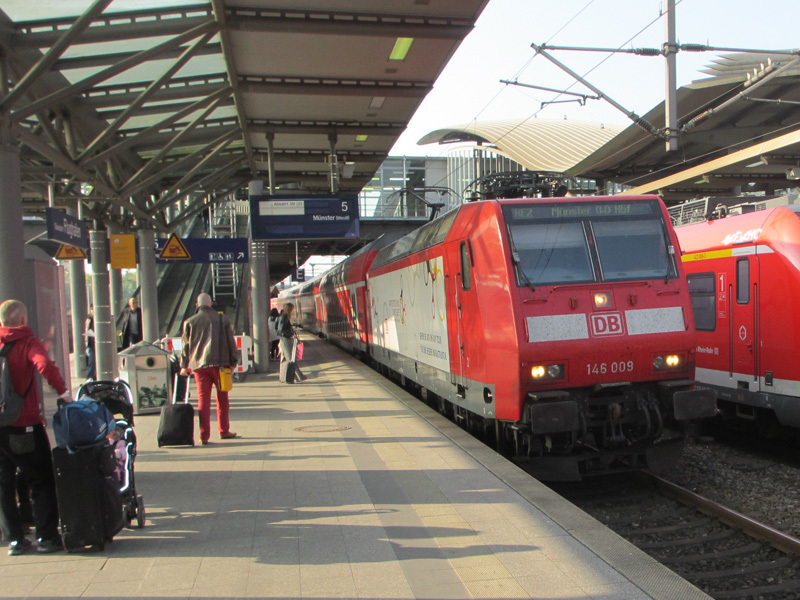 RE trains to Münster depart every hour at 13 minutes after the hour, usually from platform 5. You may check the full train schedule here. Sounds complex? It is easier than you think. We have provided more information on the ECIS 2015 website. Feel free to contact me, if you have any questions. PS: Don’t expect that there is free Wi-Fi access anywhere on the way (airport, stations, trains, etc.). German law makes it very difficult to provide hotspots. In terms of Wi-Fi, our country is best described as “Banana Republic”. 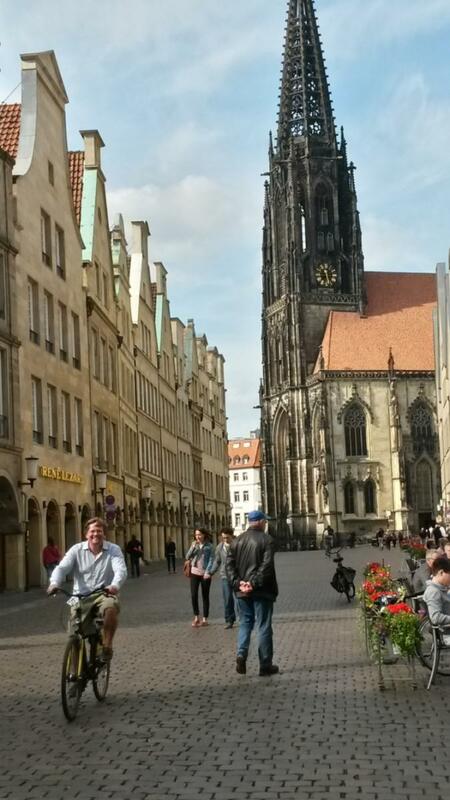 However, as soon you are in Münster, you won’t have to look far thanks to Eduroam. 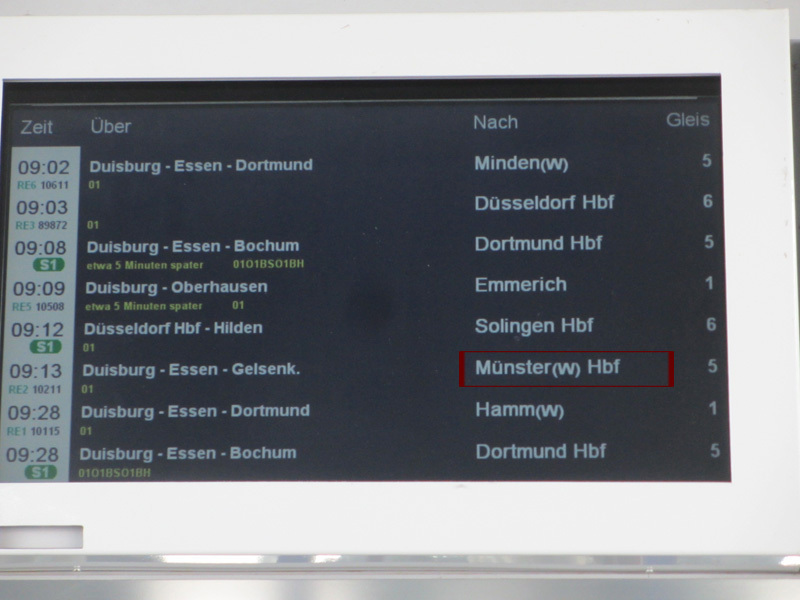 PPS: If you arrive at Frankfurt International Airport, the fastest way to Münster is also the train. Take the ICE to Cologne or Dortmund and change trains in Cologne or Essen. The journey will last approximately three hours and cost you around 100 EUR. It includes the Cologne - Frankfurt high-speed rail line. The train schedule can be checked here. Sebastian Köffer (@koeffi) works as research assistant at the European Research Center of Information Systems in Münster. He likes trains, and hates rules. This blog entry is basically for parents. While all others may ask "WT....what is a gruffalo? ", parents of small kids may most probably have heard about it. The Gruffalo is one of the world’s best-loved monsters. Since it was first published in 1999, the award-winning story of his encounter with the little brown mouse in the deep dark wood has continued to delight children and adults the world over. If you have read the storys and your family joins you for the trip to Münster, you may be interested in the current Gruffalo exhibition at the arts museum (this museum is also the venue for the conference dinner). There are a lot of illustrations, hands on exhibits, and all books published and illustrated by Axel Scheffler und Julia Donaldson. Thus, if there should be a rainy day during your stay in Münster, this exhibition can be a great option to spend some time. Katrin works as Postdoc at the Chair of Information Systems and Information Management. 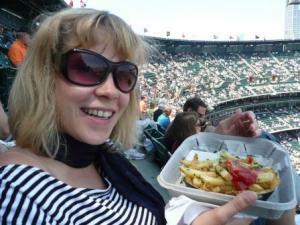 She is mother of two kids and has already visited the Gruffalo exhibition (several times :-)). Together with Armin Stein and Michael Räckers, she is heavily involved in the ECIS organization.